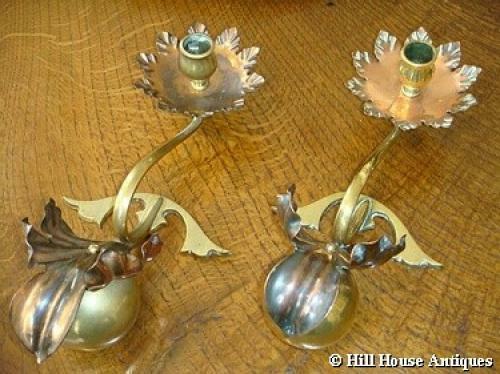 Rare pair of copper and brass counterbalance Art Nouveau cantilever mantelpiece candlesticks, by WAS Benson, c1900, with typical Benson copper floral leaves and sconce base; sinuously curved elongated arm on stylised trefoil feet and large weighted ball end. Model 204 (stamped as such) as appears in the 1899-1900 catalogues. Also illustrated in the Collectors Style Guides, Arts & Crafts by Malcolm Haslam page 63. Approx 12" end to end.